Plants aren’t just helpless victims of herbivory. They find ways to fight back against those voracious animals that can ravage them in short order. Plants can produce toxins, spines, thorns, glass crystals in their cells and many other defenses but all of these defenses require a significant allocation of energy. That energy could be spent growing new leaves, growing taller, storing more energy in the stem and most importantly, producing flowers and fruits. Plants living in places where few large herbivores are present frequently do not devote much or any energy to defense but rather put it all into reproduction. For example, native Hawaiian plants are known for their lack of vigorous chemical and physical defensive system presumably because, before man arrived, no animals were present there to eat the plants other than possibly a few birds. Another place where plants generally devote less energy to defense of their vegetative structures is New Zealand. These islands also have had no mammalian herbivores until they were introduced by man. 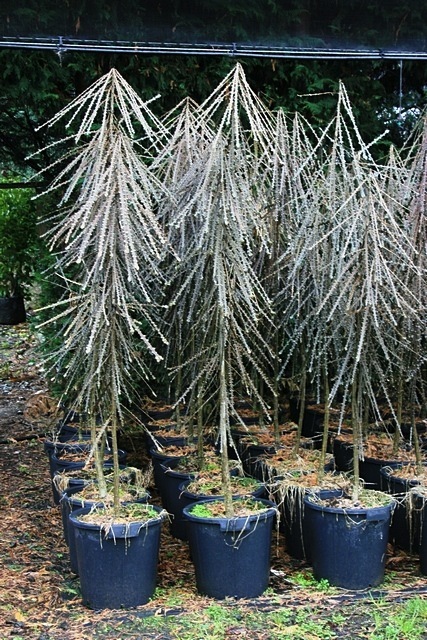 But there are a number of plants in New Zealand that exhibit an interesting form of growth called heteroblasty. This is growth form of plants wherein the leaves of a young plant will take on a different morphology (appearance) than do the adults. There are some extreme examples of this in New Zealand. In other places in the world where this has been observed it has been hypothesizes that these differences in the juvenile and adult leaves of plants was the result of a strategy the plants are employing to evade herbivory. Since most large herbivores use vision to identify plants that are good to eat the idea is that the plants will alter the appearance of the young leaves which are more critical to the life of a plant than the older leaves. After all, one chomp on a young plant might end its “life” while eating a few leaves of thousands on a more mature plant would do much less harm. An animal with a search image in mind for a particular leaf shape and color will not notice the juvenile leaves and rather move on to other species of plants or only eat the leaves of mature plants. Metamorphosis. Lancewood leaves transform as the tree grows from a seedling (top left) to a sapling (top right) to an adult tree (bottom). The tree may have evolved this changing foliage to evade now-extinct moas (inset illustration). 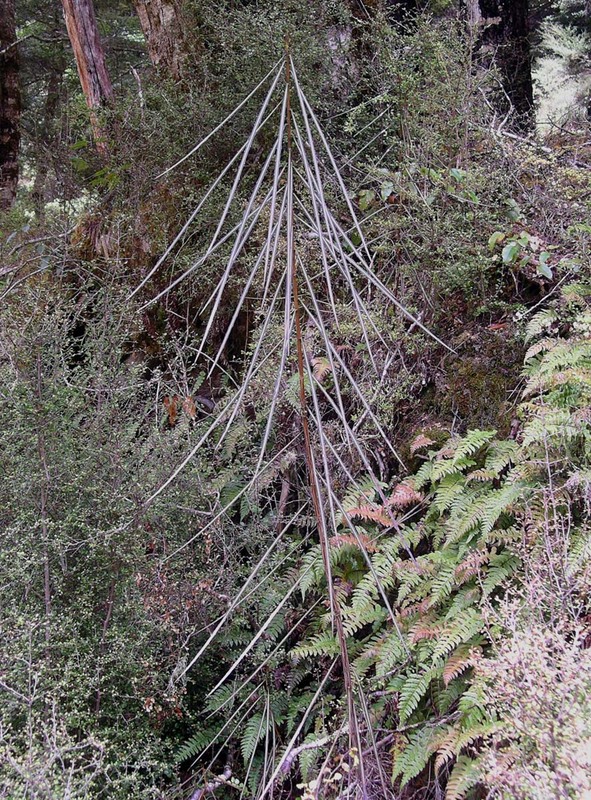 One example of an extreme form of heteroblasty is found in the New Zealand endemic genus, Pseudopanex, called the lancewoods. 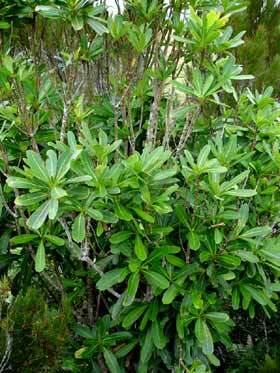 There are 12 recognized species of lancewoods which live either on the main islands or New Zealand or the surrounding small islands. Several of the common species on the main island show a very extreme form of heteroblasty which includes three stages. The first involves the earliest leaves produced which are long and thin and have brown spots on them. The second stage involves the juvenile leaves which are long and have downward facing prickles along their edges. These may be produced for many years until the trees have reached 10 feet or more in height at which time the new leaves produced are dramatically different that those produced before. They are broader, thinner and don’t have prickles along their edges. What is going on with these plants? New Zealand has been devoid of mammalian herbivores since it origin until man brought mammals there in the 1300s. Prior to that time the plants there would have no reason to use energy to grow defensive mechanisms against large herbivores. Except that there was one large animal on New Zealand before man arrived: the moa! 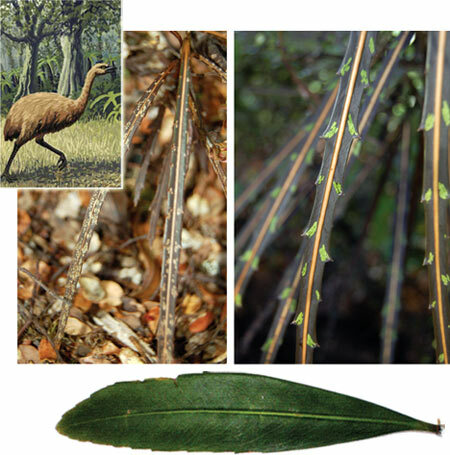 Not surprisingly it has been proposed that these plants as well as other species on New Zealand that have similar features might be adapted to herbivory by these now extinct flightless Moa birds. These birds which I have written about recently (see my post Consider the Moa: Extinct Flightless Birds of New Zealand) were very large, had only one real predator (a huge eagle), and probably were very numerous and important members of the ecological system of the islands in the past. They were also herbivores! These very large birds, many of which were larger than ostriches, had large gizzards and could consume a lot of vegetation. Young trees would have been at great risk with these large herbivores around. Think of moas like an overpopulation of deer which can strip all the lower-story vegetation of a forest bare resulting in no new trees having a chance of ever replacing the older trees in a forest. Under such high selection pressure it would make sense that plants would develop strategies to avoid being eaten. In the case of the lancewood they produce leaves with downward pointing prickles. Moas did not have teeth and so would have snapped off leaves and then likely thrown their necks back to toss the leaves into the back of their throats to swallow. The long prickly leaves of the juvenile lancewood would not have made for a tasty treat. After the plants matured into a 10 foot tree or more the leaves could then expand because they would have been out of the reach of moas. With broader leaves they could catch more sun, gain more energy, and grow into large trees. Juvenile plant of Pseudopanax crassifolius showing the downward pointing long leaves. Several researchers have tested this hypothesis of moa-induced plant changes. First one has to ask the question: how do we know that these different leaves aren’t just an environmentally induced change in the plants like sun leaves vs shade leaves in some other species? That seemed unlikely given the consistent presence of these different leaves in all observed plants of several species of lancewood but an experiment was performed in which many plants were grown under the same conditions except that some were grown under constant shade while others had sunlight every day. The result was that all the plants grew the same leaves. It seems that these leaves are produced based on programmed genetic cues not just as a quick response to simple environmental cues. But did the moas eat lancewoods plants? If they didn’t actually like to eat them, then the plants would not need these elaborate defenses whereby they disguise their juvenile leaves. Well, moas left more than their bones behind, they also left remains of their feces! Analysis of pollen grains in those feces from many species from multiple locations on the islands reveals that some moa species did eat lancewood plants (see references below). If they ate lancewoods, does the different morphology of the young plants and juveniles compared to the adults actually confer an advantage to the plants vs other plants that don’t change their leave characteristics? The authors of another study (see references) used some clever ways to test just how important the leaf changes were. First they measured the reflectance of the leaves to simulate how well leaves of lancewood juveniles would have stood out against the background of the ground litter when they were very small. What they found was that the colors that the leaves produced had remarkably similar reflectance patterns to the ground litter compared to the adult leaves which had high contrast. But what was more interesting is that they compared the leaves this species of lancewood that had very obvious heteroblasty with a species of lancewood that is genetically most similar to it (shown by another study, see references), but does not live on the main islands of New Zealand. Rather it is found ONLY on the Chatham Islands which are 800 miles to the east of New Zealand. What they found is that these two closely related species have very different juvenile leaf reflectances and morphologies. The leaves from the Chatham Islands species show little to no difference in juvenile plants vs adult plants. As an aside, there are other species of species of lancewood on other small islands off of New Zealand that also lack this heteroblasty feature. So what accounts for the difference between the Chatham islands species of lancewood and the New Zealand species they investigated? They propose that this is further evidence that the moas are the cause of the New Zealand plants diverse morphology as the Chatham islands represented their “control” plant since no moas, or any other herbivore for that matter, has ever lived on the Chatham Islands until today (there are a lot of sheep there now!). Never having experienced the natural selection due to the presence of moas, the Chatham island species of lancewood either never “evolved” the heteroblasty character or they lost the ability to produce the different juvenile leaves. The thin strap-like leaves of the New Zealand species that even have brown coloration are clearly not as efficient at converting energy from the sun into sugar and so the plants grow very slowly for many years before they can produce the adult leaves. The Chatham island juvenile plants can grow more quickly because they have both more surface area to collect the sun’s energy and they are not using their energy to grown thickened leaves with prickles that do not do photosynthesis. Pseudopanax ferox (the saber-toothed lancewood) showing juvenile plants being cultivated. The eventual adult tree is what the person purchasing this tree is interested in rather than this tough looking plant in its juvenile stage. How to best allocate resources is the question plants are always faced with. If it were just a matter of losing a leaf once in a while or a few plants were killed by herbivores it probably would not be worth the plants time to devote huge amounts of resources as many plants would survive to reproduce and thereby pass along their genes. But if herbivory is an ever-present danger and only a few plants are becoming adults and reproducing then the plants that have some defenses against herbivory will clearly have an advantage. Any small changes in a leaf color or shape that confers even the smallest benefit will find itself at a selectional advantage and have a greater chance of passing its genes to its offspring that will look more like it than the other members of the population that were not able to reproduce. Moas in high density could have been a destructive force acting on these plants and thereby selecting characteristics in the plants that make the juvenile leaves less and less palatable over time. This is natural selection at work: the presence or absence of moas result in the sculpting of the lancewood genome over time. 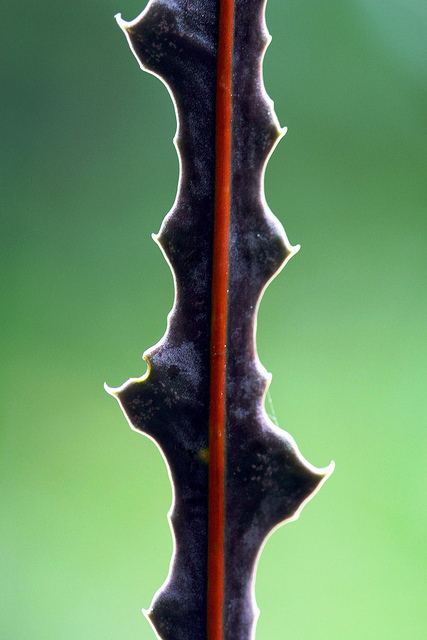 Stem of the juvenile plant of Pseudopanax ferox showing the defensive hardened epidermal extensions. How does this apply to the questions of my recent posts on kinds/species? You may be saying to yourself that this sounds reasonable but you may also believe that this sort of selection on the genome probably doesn’t take very long. Isn’t this just a matter of sorting out some genes to get the desired morphology? If you are thinking this could happen in a few generations or in a few thousand years then I would say no, natural selection typically doesn’t work at this speed. Different leaf morphologies at different stages of life is much more complex than one or two variations of genes like alleles for eye color. These characteristics are controlled by a complex set of gene interactions and developmental switches. The adaptation of these plants to moa would likely have required tens of thousands if not much much longer to develop these features. In fact, just look at the plants today! They are programmed to make these leaves this way and even though the moas have been gone for 400 or more years they are still making their leaves this way. Natural selection today is not selecting for the maintenance of these features but it will likely take thousands of generations for these plants to rid themselves of the genetic programming that they developed while the moas were around. Let us look more closely at the lancewood species that is most closely related to the New Zealand one. It doesn’t have these characteristics. Interestingly, the authors studying this species believe that this species probably did exhibit similar characteristics when the plants first made it to the Chatham Islands. Why? Because the other four species on New Zealand, which are very similar genetically, all have these juvenile leaf features and these Chatham Island species looks to be an offshoot genetically of these mainland species. What likely has happened is a single plant seed was accidentally brought to the Chatham Islands by a bird from New Zealand. Once there it grew into a tree and started to produce seeds. That first generation produced juvenile leaves just as they did in New Zealand, but without the moas around to pressure the plant to keep these features, the plants that had genetic variations that resulted in broader leaves with fewer spines would have been faster growing and made more seeds and so eventually the plants adapted to this new island by changing its genetics to favor similar juvenile and adult leaves. How long did this take? The fact that the plants on New Zealand have lived without moas for 400 years now and yet are still acting like the moas are alive tells us that this doesn’t happen fast. If the Chatham Island species have already completed this process of changing these leaves back then these plants must have been there a very long time without moas to have made this transition. These plants challenge the typical episodic creationists (ie. young earth creationists) expectations regarding how quickly plants and animals could have evolved. They would prefer to see these plants as having genetics that could be quickly adapted to these islands and its fauna, the moas. But do we find evidence that this fast change happens? No, rather what we have are many examples of islands where animals were introduced by man 500-2000 years ago have been devastated by those introduced animals. We see little to no evidence that in this short time frame plants have been able to quickly adapt/evolve new characters to ward of these new pests. These data suggest that such rapid (less than 4000 years and only a few hundreds generations at most) change is not realistic, observed or expected to have occurred but rather quire considerable periods of time for these changes to take place. 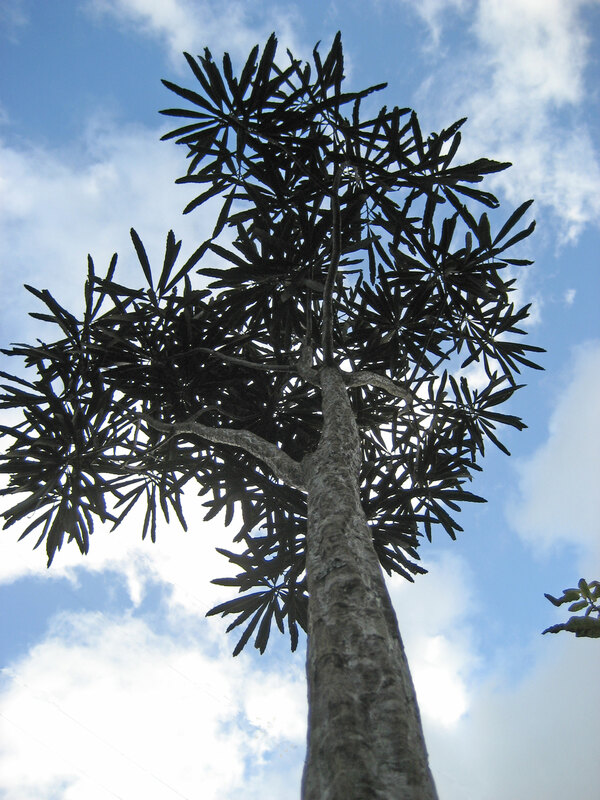 Reconstructing the species phylogeny of Pseudopanax (Araliaceae), a genus of hybridizing trees. L. R. Perrie and L. D. Shepard. Molecular Phylogenetics and Evoltuion. 52(2009):774-783. Pollen analysis of coprolites reveals dietary details of heavy-footed moa (Pachyornis elephantopus) and coastal moa (Euryapteryx curtus) from Central Otago. J. R. Wood and J. M. Wilmshurst. New Zealand Journal of Ecology (2013) 37: 151-155. I see this article is nearly six years old, so my response is rather tardy, but I only just noticed a link to it, and explored.There appear to be no other comments. Whether this is because there never were or to do with how older articles are stored on the blog I know not. Fascinating information. It started me ruminating on some of the factors involved in the varying speeds at which evolutionary change has occurred in different species in different places and at different times. One factor that you write about is the complexity of the genetic programming that is involved in producing a particular feature in the organism that differs from its close relatives elsewhere and/or its ancestors. Some changes are accomplished by a single allele alteration, or a larger section of code being by one simple “operation” rendered active or inactive, or permanently removed from the genome. With other changes at the whole organism level several different changes at the genetic level are involved. We would expect that the first sort of change would happen relatively frequently, and quickly, in a situation where there was a shift in environmental pressures, while the second would require, on average , much longer to occur. And of course some changes are much more readily reversible than others. A switch can be turned on or off with equal ease. But while it’s equally simple for a substantial chunk of genetic code to get omitted from a genome by a single chance, once this has happened it must be nigh impossible for that exact same sequence to be “reintroduced” by a single chance mutation. In the case of these trees, it’s not in the least surprising that the trait still persists in the population long after the environmental pressure that caused it- the moa – has been removed. They are trees. What’s a few hundred years to a tree, as opposed to an iguana, a finch, a fruit fly? Half a generation, if that, for a single mature oak tree to be replaced by an offspring of similar age growing in the same spot, which has had no chance of flourishing there, or elsewhere, until its parent, or some other mature tree, has reached the end of its natural life span. (Lancewoods may be somewhat different in life span to oaks of course,but presumably we’re in the same ball park.) Whatever competitive edge having larger, greener, juvenile leaves, in the absence of moas, would give one seedling or sapling against another is no use at all against the mature trees already in situ, which have passed the stage when the presence or absence of moas would make any difference to their welfare. So while the trees presumably do produce seed annually, and in large quantities, and in each seed there is the potential for mutation to have occurred ( and even a single year is a long time compared with the reproductive cycle of a mouse, let alone a bacterium) natural selection has so far had no opportunity to favour any such mutation in the direction of larger, greener, tenderer juvenile leaves even if it had chanced to arise in one particular seed.